I’ve never met a fruit or vegetable that I didn’t like. Unfortunately, not everyone (and I mean everyone I live with) shares this sentiment. I’ve long accepted Andrew’s aversion to raw tomatoes, but when it came to eggplant, I was sure I could make him see the light. Since eggplant season started in July, I’ve been cooking it a lot and to my disappointment, with little enthusiasm from Andrew. Even the eggplant gratin that I made the other week couldn’t convert him (I was sure it would). After having to consume a lot of eggplant dishes on my own these last couple of months, I resigned eggplant to the “don’t make for Andrew” list along with his stubborn raw tomatoes. That’s when I decided to make this dip, which is made with roasted eggplant, sautéed onions and garlic, and a good amount of Greek yogurt. I had no intention of sharing it with anyone. It was just for me, eggplant-loving me. Apparently, he doesn’t hate everything with eggplant in it after all. As delicious as this dip is, I almost wish it was more eggplant-y, but for someone like Andrew, it’s just perfect. I’m still keeping eggplant on the “don’t make for Andrew” list, but I’m happy to have found an exception to the rule that we can both enjoy. Preheat the oven to 450 degrees. Prick the eggplants all over with a fork and place on a rimmed baking sheet. 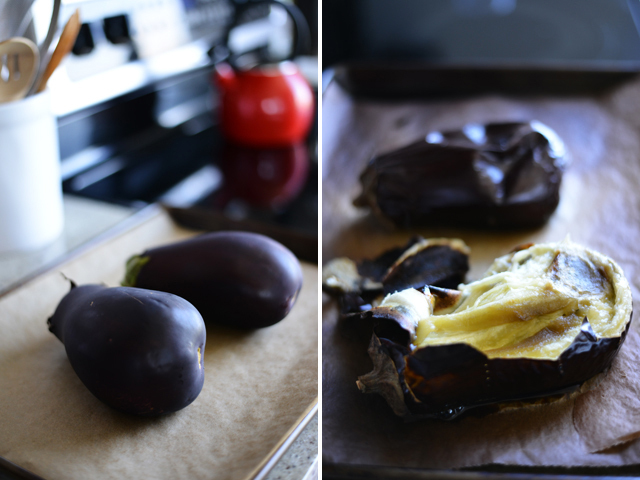 Roast for about 45 minutes, until the eggplants are soft to the touch and cooked throughout. Once the eggplants are cool enough to handle, scoop out the flesh (discarding the skins) into a bowl and use a fork to break up the eggplant until it is smooth. Then place the eggplant in a fine mesh sieve over a bowl to drain any excess liquid. Meanwhile, heat the olive oil in a sauté pan and add the onion and garlic. Sauté until the onions are nice and golden. Turn the heat down to low and then stir in the drained eggplant and sprinkle with paprika. 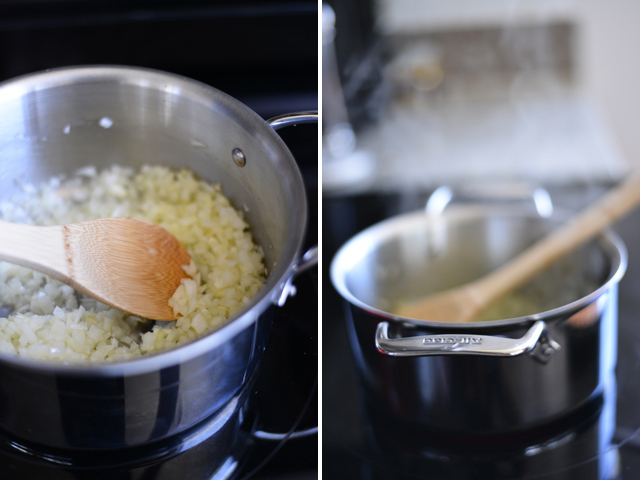 Cook for about 5 minutes, stirring frequently, to meld all the flavors. Transfer the mixture to a bowl to cool. Once the eggplant and onion mixture has cooled, stir in the Greek yogurt and season with salt and pepper. Garnish with mint or parsley and serve cold or room temperature with pita chips or bread. That looks like a very moreish dip! When I was a child, I only liked a particular eggplant dish, wasn’t keen on eggplant anywhere else. In my late teens/early twenties, I found another eggplant dish I enjoyed. And now I pretty much love eggplant anywhere, as long as it’s well-prepared. There’s always hope! Thanks for the encouragement, Leaf! in the land of hummus & guacamole, this is so nice to see! looks delicious. It’s funny how some people don’t like aubergine (eggplant, sorry!) 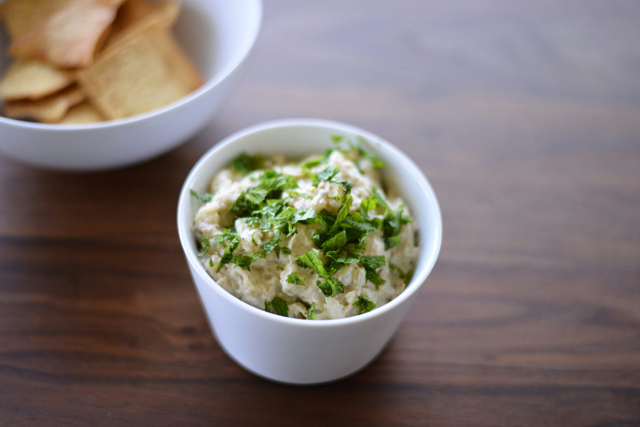 – I absolutely love it every which way, especially in a creamy, smoky dip like this. I wish people called it aubergine here–it sounds so much more appetizing than eggplant, don’t you think? I’m with you though, I love it every which way too. How does a country boy from the Midwest grow up hating tomatoes??? His mother apparently did not prepare enough interesting dishes to develop his palate. :-) I must confess that I am not the biggest fan of eggplant, but this dip even looks yummy to me. I love the unusual and unexpected things you make. Keep up the great work! MmmYum. I have all of these ingredients at home – where I get all of the yummy eggplant dishes to myself by default, as I live alone :) – will be making this for sure! Roasted eggplant is just about the best thing in the world. 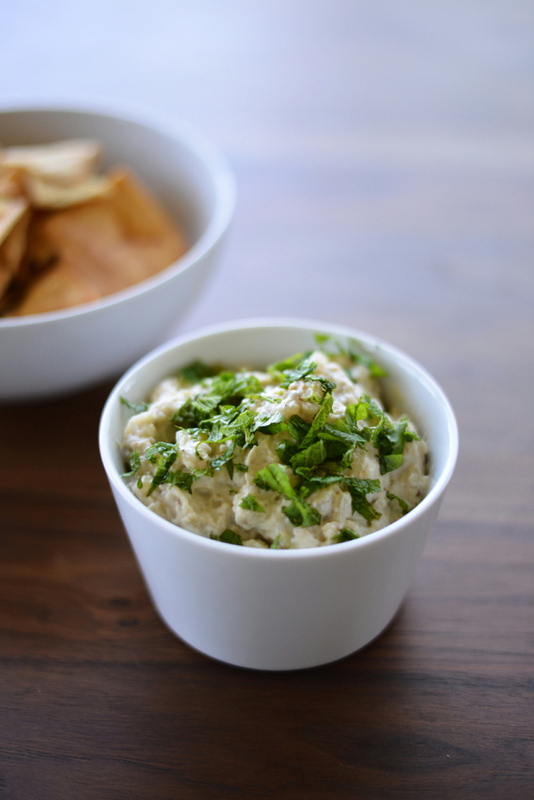 I’m a regular eggplant user but I love the idea of this dip with the onions – YUM.